Welcome to DANISH's charming world. A timeless story tells us about the romantic, fun, fascinating and unforgettable moments in our lives. DANISH consists of beaded jewellery which you can combine to emphasize your personal style and taste. You’ll have plenty of chances to discover DANISH's world on this website. 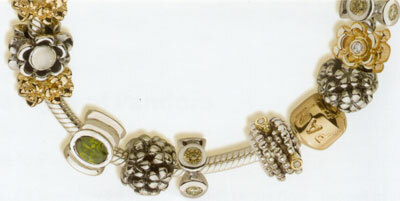 Start with a base piece of jewellery, and then choose which beads and charms you want to add for decoration. You can start with as few or as many beads as you want. The beads and charms are handmade pieces of jewellery in silver or 14k gold with romantic, fun, fascinating, and unforgettable details. An exciting feature of this range is that you can keep adding to your DANISH collection over time. Unlike other jewellery ranges, the beauty of the DANISH collection is that you can add to your collection over time. You can start with two or three beads, then buy more in the future to add to your bracelet or necklace over time. And, you can suggest beads to friends and family that they can buy for you as gifts too. Your DANISH beaded jewellery tells your own personal story. We hope you will be inspired by the endless choices which DANISH opens up. DANISH jewellery is based on Danish design and has been created by close cooperation between jewellers and designers in Denmark . nb: "DANISH" means a famous DANISH Company - whose name must NOT be spoken.